Eat the Rainbow! Buy fruit in all colors of the rainbow and arrange on a plate in the shape of a rainbow! Have your child taste test the fruits on the plate. Naming colors and fruit as you go! Some suggestions: apples, grapes, kiwi, bananas, strawberries, pineapple, oranges, and blueberries. Want to know how food travels through your body? 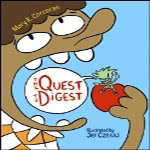 Watch/read The Quest To Digest by Mary K. Corcoran; illustrated by Jef Czekaj!